One of the great things about a road trip is that you can hop off the interstate at a moment’s notice and explore the road less traveled. And that’s exactly what we did yesterday when we drove from Dodge City to Wichita. Instead of taking Interstate 50 most of the way, we planned a little detour with a stop in Pratt, Kansas. And I have to admit, it wasn’t the day we planned, but in this case, that was a very good thing. 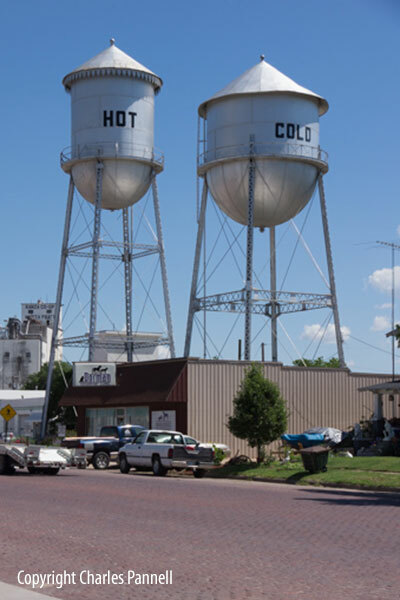 To be honest the big attraction of Pratt was their two water water towers – one was labeled “hot” and the other was labeled “cold”. They are located at the intersection of Highway 281 (Main Street) and Green Street. You can get a good view of them from the Pratt Community Center parking lot (which has accessible parking), located just across the street. OK, it may be a bit corny, but it’s kind of a fun roadside attraction. After we had our fill of the twin towers we decided to visit the the Pratt County Historical Society Museum, but unfortunately it was closed. If you do decide to go that route, there is accessible parking in front, with level access to the building. Plan ahead though, as they are only open from 1-4 in the afternoon. So with nothing to do in Pratt, I did what any good road-tripper would do — I consulted Maynard (my GPS). And according to Mr. we were just a half-mile from the Vernon Filley Art Museum, so Charles and I decided to drop in to see what it had to offer. At first glance I was impressed with the modern building, but I was in no way prepared for what I would find inside. I was expecting a gallery filled with local talent, but I was completely floored when I discovered that the gallery was filled with works from two major artists – Roger Williams and Robin Laws. The brainchild of Mimi Filley, this local gem is just a year old. The Filleys had a second home in Santa Fe, and as avid art collectors they became acquainted with the local gallery owners and artists. And since Roger Williams was one of her favorite Southwest artists, she purchased a number of his works. The original plan was for the museum to be a showplace for Filley’s large art collection, but when Roger Williams learned of her intent, he offered to exhibit some of his work there. And then he recruited Robin Laws to do the same. The result is an impressive exhibition of Williams’ Southwestern style paintings, and a large collection of bronze sculptures created from Laws’ life experiences. 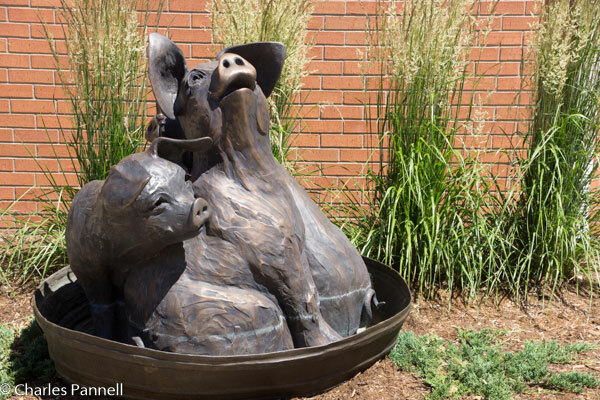 One of my favorite works of Robin Laws is her whimsical Hog Wash piece. It appears as a sculpture in the main gallery and as a fountain in the back courtyard. Her inspiration came as she was watching a friend bathe her pigs in the backyard, in preparation for the county fair. When her friend was interrupted by a phone call, the pigs were left to their own devices, so they grabbed the hose, started to enthusiastically play with it, and soon soaked everything in sight. The jubilant nature of their unrestrained joy is reflected in the work, which was created on the day that Laws discovered she was cancer-free. The current exhibit runs through July 25, and after that, part of the museum will feature works from Mimi’s large collection, while the other part will showcase visiting artists. And with Mimi’s art connections, you never know what treasures will turn up. 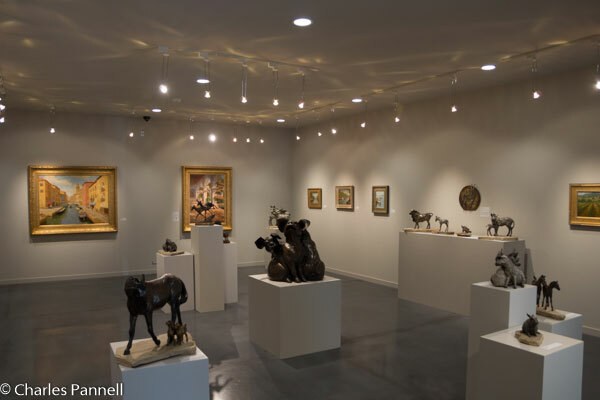 So if you happen to find yourself wandering around Central Kansas, be sure to stop in and see what the Vernon Filley Art Museum has to offer. I guarantee, you won’t be disappointed. The access is excellent, and the subject matter is quite intriguing. This entry was posted in Attractions, Destinations, Road Trips and tagged art, Kansas, museum, road trip, roadside attraction by Candy B. Harrington. Bookmark the permalink.